We spent the last few days at the BEAUTIFUL Crater Lake National Park. 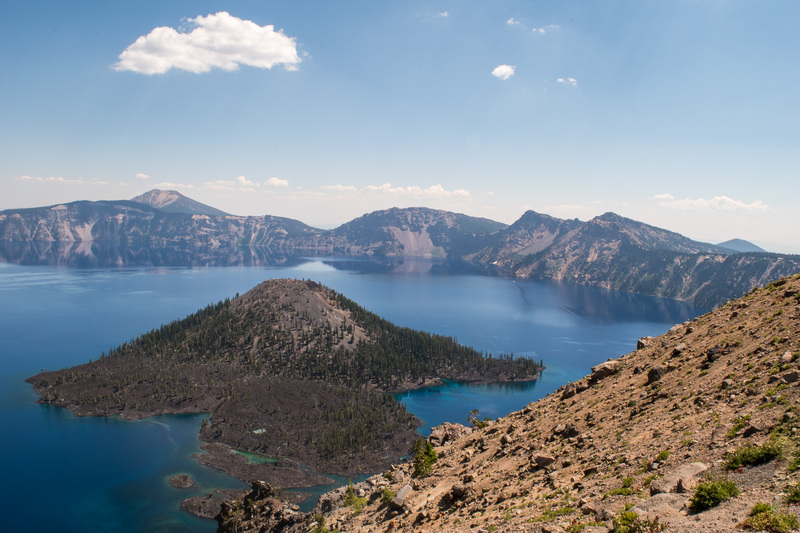 Crater Lake was formed when Mount Mazama erupted over 7,700 years ago. As the magma chamber emptied the mountain could not support its own weight. It collapsed and created this stunning caldera, which over time filled with water from rain and snowfall. 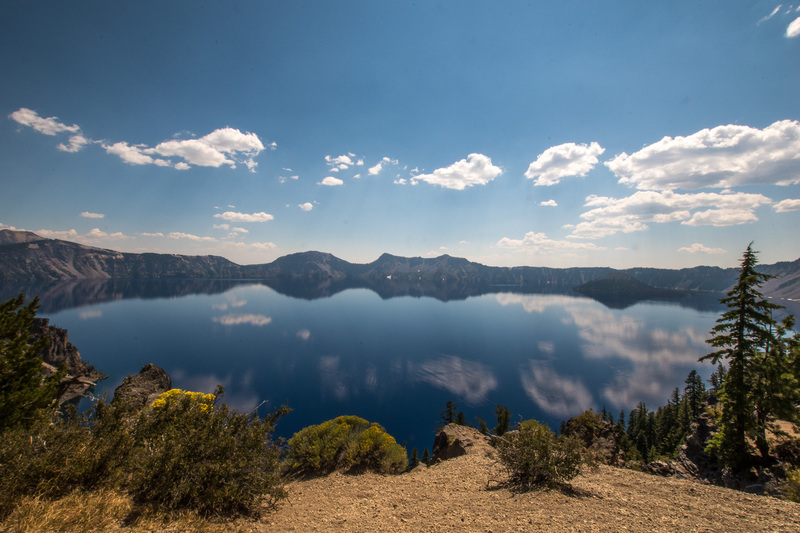 Crater Lake is the deepest lake in the country – with the deepest point at 1,943 feet. The National Park offers many activities, including a drive around the rim of the lake, a boat tour of the lake, and numerous hikes! We arrived Tuesday a little later than we hoped due to a nail in our truck tire. Our goal was to leave Mount Shasta KOA by 9AM Tuesday, and when we were prepping the truck with the hitch the truck’s sensor went off indicating a tire had low pressure. Sure enough – there was the nail. 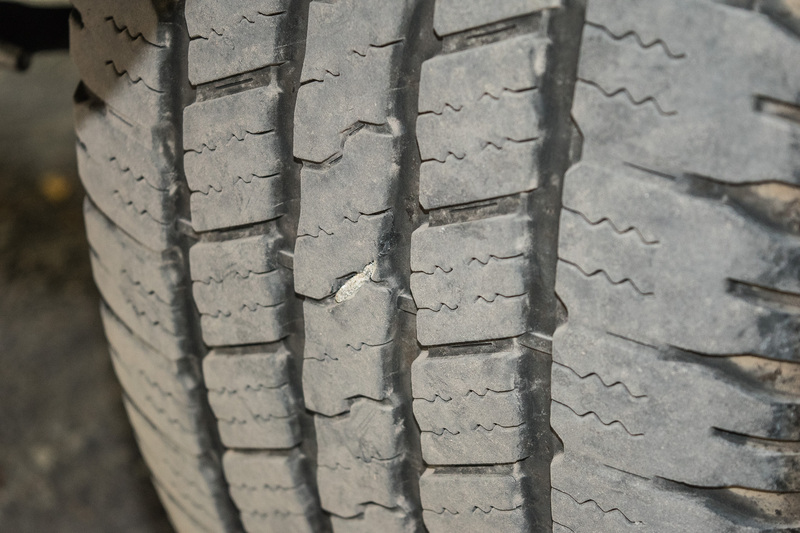 Luckily there was a tire shop within a few blocks of the KOA. We were able to get it fixed and left Mount Shasta at 1:00 – four hours later than our original goal (Shout out to Point S tire in Mt. Shasta, for squeezing us into their busy schedule, fixing the tire the proper way and refusing to charge us and profusely apologizing for the wait! Seriously, if you are in the area please support this business). 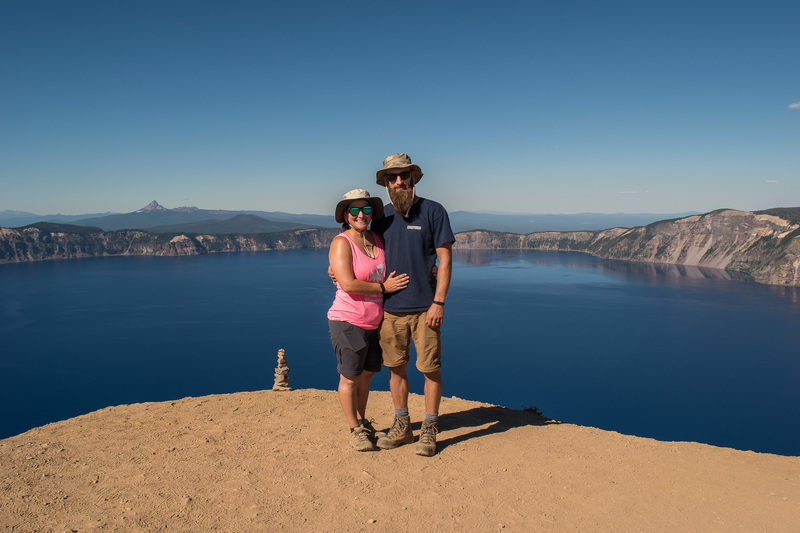 By the time we arrived at Crater Lake it was evening time and spent the rest of the night unpacking and getting settled in. Thank you everyone for the numerous suggestions from our last blog post! We really appreciate the feedback & suggestions. 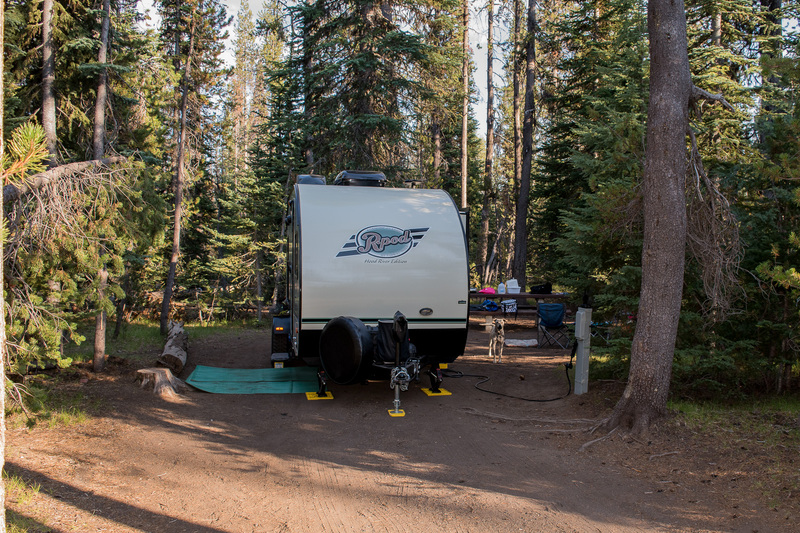 We stayed at Mazama Village, a campground run by a concessionaire inside the National Park. We booked one of the “small RV spots” (only a few are electric hookups, the rest are “dry camping”). When you book your stay here, they reserve a spot for you, but basically, it’s first come first serve. By the time we arrived, all the electric spots had been picked, so we ended up dry camping without any hookups. We later ended up switching to an electric spot so we could charge our batteries before dry camping for the next few days outside Portland. Mazama Village is pretty big – it has a restaurant, hotel, cabins, RV/Tent camping, showers, laundry and a store. We learned pretty quickly that outside the store is a popular spot for the PCT Hikers. This was exciting for me, because I am obsessed with the PCT – have you read the book Wild: From Lost to Found on the Pacific Crest Trail? If not – I highly recommend it! The PCT hikers are everything that I imagine they would be – vary in age, gender, race, all with tattered clothes, shoes, dirt tans, but all smiling ear to ear. PCT hikers are allowed to stay here at Mazana Village for free, and during our stay, we saw a few hike out to the lake to take in the spectacular views. Our actual camp spots were great, lots of tree to provide shade, and a lot of space between campsites. 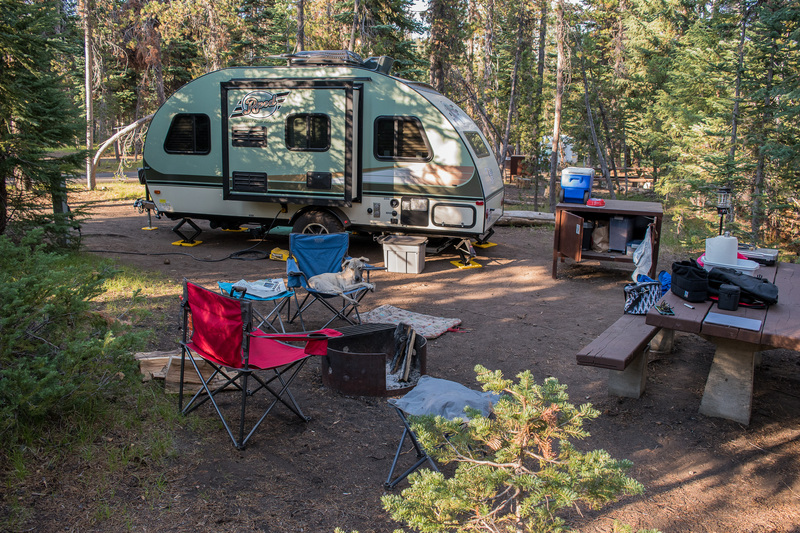 The small RV spots on a weekday were $31/night. For those looking for more of a grander stay, you can stay in a cabin for $152/night, and for those big spenders you can stay at the Lake Lodge – with views of the lake – starting at $180/night! On Wednesday we dropped Sparky off in Prospect for a day of doggie day care. We used the app, DogVacay to find it. Maura and Steve were fantastic and had a huge fenced in farm, with two well-trained German Shepherds that Sparky got to run around in and play with. Of course, when we picked him up that evening she said he spent most of the afternoon laying next to her on the couch in the A/C. With Sparky enjoying his day on the farm, Steve and I had a few choices. It was highly recommended that we take the Boat Tour, which we planned on doing. However, once we arrived we learned that part of the Rim Drive is being repaired, and Cleetwood Cove Parking Lot & Trail were also closed for repair. We were told there was no access to the shore unless you had a boat tour, in which case you had to be on a special shuttle. The special shuttle only left every few hours, to make it to the 1:15 tour boat, we had to be on a noon shuttle, and would have to wait for the 5:00 shuttle back. After some discussion and debate, we decided that after a day in the car it was best to hit non-dog trails. We were really disappointed that we didn’t make it to the boat, but when you have a dog with you it makes it challenging. I do feel we will be back (and once you see the pictures you would agree to come back too), and when we do, the boat tour will be there for us. Our first trail of the day was hiking Mount Scott. Mount Scott is the highest peak in the National park – 8,929 feet in elevation. The hike has 1,250 feet of elevation gain and promised to have spectacular panoramic views. We started the hike around 10:30 AM and got lucky with weather. 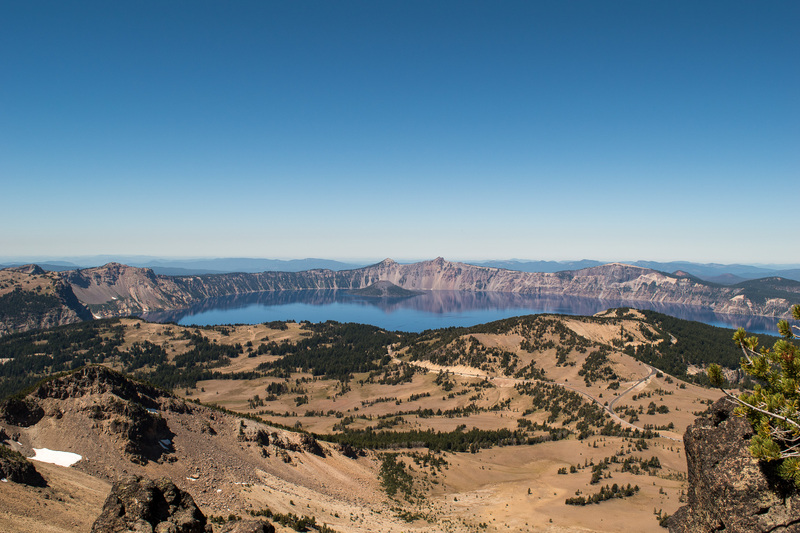 The hike itself offered tons of great views of both the lake and of the Klamath Basin. We met several friendly hikers along the way from all over the world. The hike was 5 miles round trip and was classified as “Strenuous” from the National Park services. Steve and I decided that the hike was not as challenging as Mission Peak in Fremont, CA., but the elevation made this particularly grueling. The views were worth the sweat! After conquering the highest peak, we thought… hey… what about the second highest peak, the Garfield Peak, at 8,054 feet elevation – it supposedly had better views because it was closer to the lake. 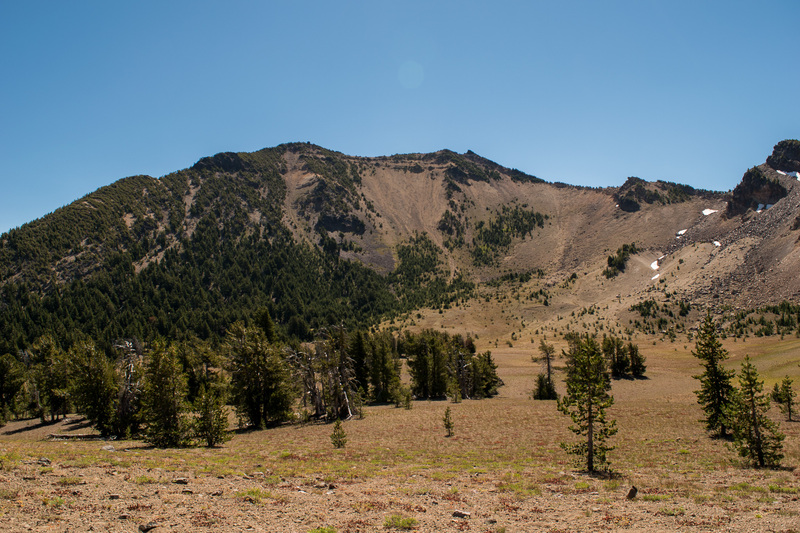 The Garfield Peak trail was 3.9 miles round trip and had an elevation gain of 1,010 feet. 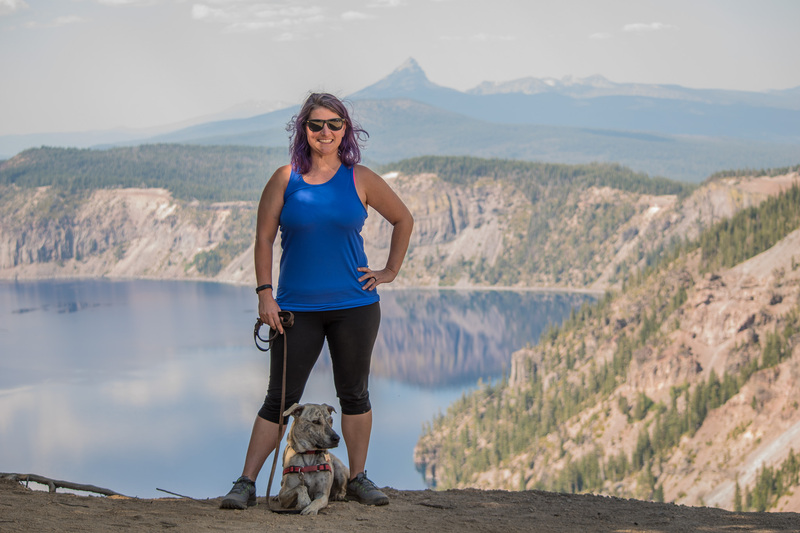 This hike, even though less in mileage, took us a while to get through for three reasons: One, along the hike were outstanding cliffs that you could peer directly down into the lake – both incredible and a tad scary that there isn’t fencing. Second, it was HOT by the time we started. Third, we were quite a bit more tired after climbing Mount Scott. But once again, Garfield Peak didn’t disappoint with astounding views. Garfield Peak also differed from Mount Scott in a few ways. It was a lot closer to the lake, and because of that there was a whole different ecosystem. Garfield Peak trail had beautiful wild flowers growing along the trail, which I believe made it a much more friendly trail. Both trails had areas of sun and shade. At the peak of the hike we stayed for close to 30 minutes, enjoying the scene and rest. We met another couple, Stephen & Emily, who were in the middle of their own adventure similar to ours. Check out their blog theroadabides.com. Thursday was our day to sleep in… till 8:30. It counts as sleeping in because we went to bed 10:30 the night before. We were exhausted from the hiking. We took most of the morning easy, except we did move our whole campsite to an electric hookup – taking about an hour from our day. At around 11AM we hopped in the car and decided to hit the Lake’s Rim Drive plus two hikes with Sparky. Our first hike of the day was the Godfrey Glen – it was dog friendly, 1 mile and 90% in the shade. You do not get any views of the lake from this trail, but you do get gorgeous views of a small canyon with a creek on the bottom. The trail was quiet as we were the only people on it, with the exception of one other hiker & his dog at the beginning of the trail. Overall, it was very pretty and Sparky enjoyed chasing the ground squirrels. I think if we didn’t have Sparky, we probably would’ve skipped it and been fine too. We moved over to the Steel Visitor Center, where our second dog friendly hike was, Lady of the Woods trail. You start this 1 mile loop behind the visitor center where you pick up a pamphlet to accompany you. The trail basically takes around the employee lodging and talks about the architecture of the lodges themselves. All of the buildings were built in the 1920s, 30s, and 40’s and are expertly crafted to fit into the landscape. 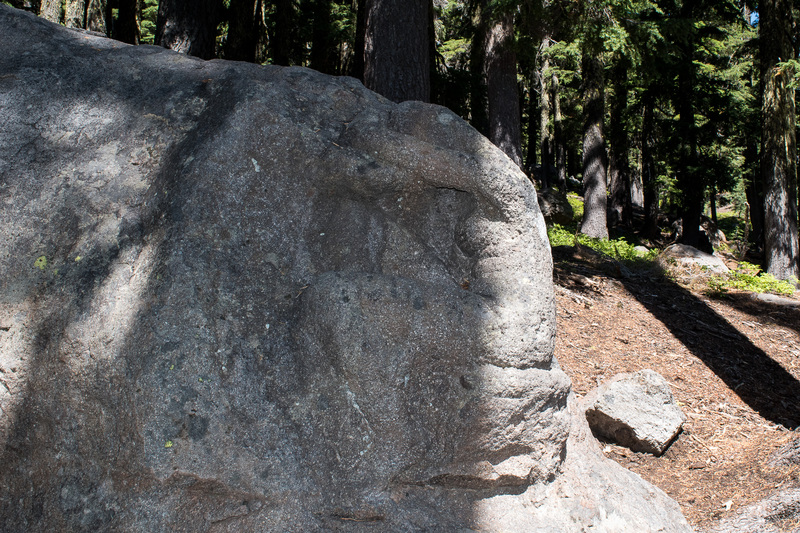 This trail also goes along the creek and through a meadow, and to a rock that was carved into a shape of a woman (thus the name – Lady of the Woods). It was then time for the Rim drive! The Rim drive is 33 miles around the lake with over 30 scenic stops. We didn’t stop at all 30 stops, but hit about half. The views are just unbelievable. We made sure to hit the “must sees”: the Phantom Ship – a small island made of erosion-resistant lava, 400,000 years old and the oldest exposed rock within the caldera; the Pumice Castle – a pumice rock that has been eroded into the shape of a castle; Wizard Island – a cinder cone that erupted out of Crater Lake approximately 7,300 years ago; and more incredible views of the lake. We decided to make the 6 mile detour to visit the Pinnacles – also spectacular. 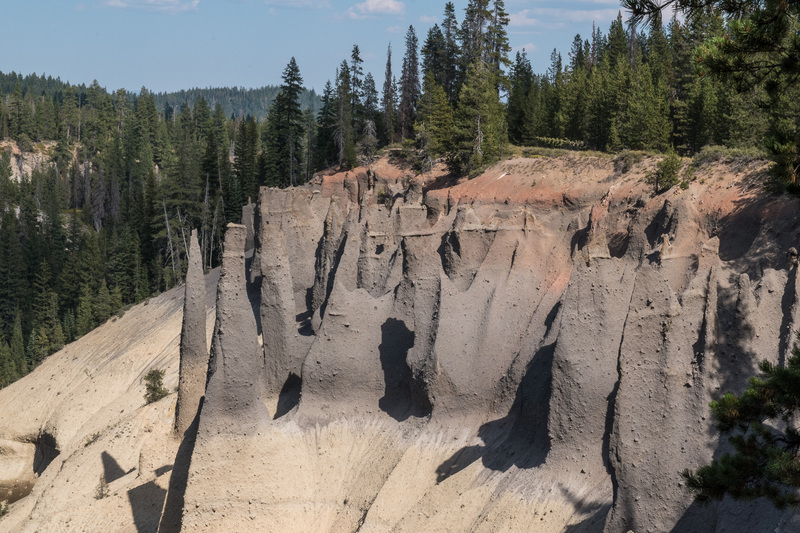 The Pinnacles stand at 100 feet tall and are colorful. After the drive we headed back to camp to take care of laundry, cook dinner and work on our photos. I was lucky enough to be in charge of laundry, and in this case… I really mean lucky. The laundry facility was near the camp store so as I waited for laundry to be done I was engrossed in the stories of the PCT Hikers. A few were from Germany, a man from Australia and the others from all over the US. As newcomers came by and went to the store to pick up their packages, they would come out reading notes from their parents & loved ones, who usually also send goodies in the form of sweets. All of the PCT Hikers shared amongst themselves – the laundry machines, food, and even Wifi (one guy bought the $10 24 hour package and passed his phone around so people can check their emails and communicate home). There was a buzz in the air around them, which made doing a dull task like laundry a little bit more fun. I really admire people who can do something so physically and mentally demanding like that. Who knows… maybe Steve and I can do that one day? We learned here that traveling with a dog brings rewards and challenges. We would do more hikes – there are at least half dozen more we would’ve liked to do. We also would go on the boat tour, I know many of you guys suggested us doing it and we were disappointed we didn’t. We also would do a guided Rim Drive Trolley Tour. We should note, the park is doing some major repairs, besides the Cleetwood trail & parking lot repair, the West Rim drive is undergoing huge renovation, causing delays in that area of the drive. The park is undertaking a 3-year, $18 million repair for 10.7 miles of the West Rim. Those roads were built in the 1930s and in need of some TLC. 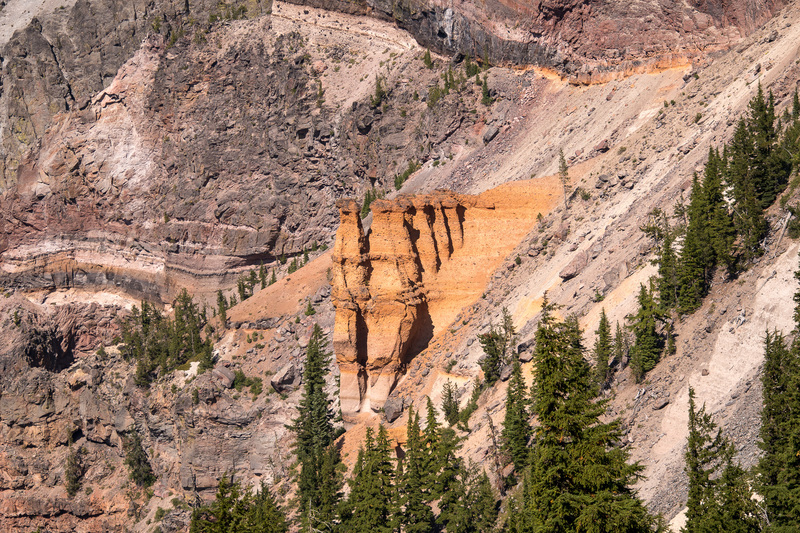 Most of the roads were damaged from rock fall or snow, so if you do come to Crater Lake (which everyone should), be aware that driving around the Rim can be a little slow and patience (and flexibility) is required. We are on our way to Tillamook State Forest in Oregon to meet with our friends Peter & Amiee for a weekend of fun! Glad you had great weather – it’s so beautiful there. Likewise the Oregon coast is stunning! Enjoy the beauty of the Pacific NW! See you soon! Very pretty! I love the picture of you and Sparky on the rim drive.